WASHINGTON, D.C. – April 11, 2019 – One of the District’s most popular Spring events, the DC Bike Ride, returns on Saturday, May 18. 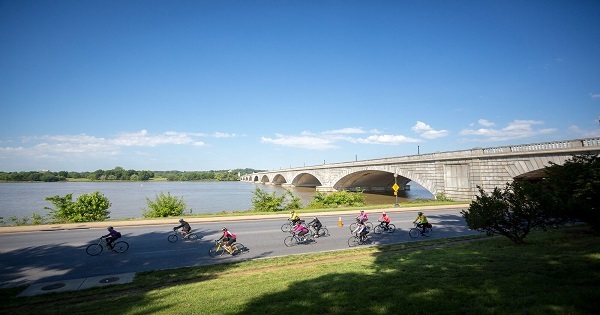 For one morning only, more than 8,000 riders of all ages and skill levels will have the opportunity to ride 20 miles of roads around some of the capital’s most iconic sites without cars, ending with the celebratory Finish Festival in front of the U.S. Capitol. The DC Bike ride is a celebration of all the District has to offer both its residents and tourists around the year. Throughout the ride, participants will visit taste stations highlighting some of DC’s most popular restaurants, and popular bands/DJ’s from the region will provide en route entertainment. Riders are encouraged to capture these moments throughout the experience and share their love for the District in the DC Bike Photo Scavenger Hunt. Participating in the DC Bike Ride is easier than ever this year for riders and families. Now, riders are able to rent their bike on-site for only $12, thanks to a partnership with Unlimited Biking. Riders pick-up and drop-off their bike at the event Finish Line for a seamless experience. Registration for the event is $65, with early-bird and youth pricing available. To register for the ride and find more information about DC Bike Ride, please visit www.dcbikeride.com.